At my church, we still have an analog Mixer. It has 24 channels, 4 sub groups, Left/Right and Mono out. We use the sub groups. Vocal, Drums, Instruments and Leadership mics. The mixer has mutes on every channel, on each of the mute groups and on the 3 master outputs. Fortunately, we have a church were the acoustics are stable. We can run all of the mics open without feedback for normal worship levels. Monitors are stable and so on. It is also a good sound rig. When I run the mixer, I turn every channel on and shut off any mute switches. I control all of the levels with the sub groups. I don’t want any surprises. This Sunday it was my turn to run the mixer as we are on a weekly rotation. Thursday night was rehearsals. Missed the rehearsal. Friday night the Youth used the sanctuary and someone used the mixer. Things were changed but it only took about a minute to set everything back. As usually, you arrive at the church early for a pre service warmup. Dialed up a great monitor mix. Everything seem right and as typical, we rehearse and warm up with the FOH speakers off. When the worship team stopped it was time to turn on some background music. Turned on the CD player, saw activity on the channel, raiser the fader for the channel and the channel was assigned to the Mono Main Out. Raise the mono out and nothing happened. What!!! Checked the power switch to the powered speakers. Check to make sure the processor was on and passing a signal. Nothing. Called the head tech for the church, he checked everything out. He checked the mixer and he agreed with me and thought that the power switch was faulty. He removed the power switch and bypassed it. Still no sound! Double checked and found that the power lights on the back of the powered speakers were indeed on. The head tech and I stared at each other confused wondering why there was still no sound. Then he looked at the mixer again and this time noticed that the Mute switch on the Master Mono Main out was engaged. He hit the mute switch and the rest of the sound system came to life. In the year of mixing at the church, the Main Left/Right and Mono outs have never been muted. The mixer is a spilt mixer where 16 channel are on one side of the mixer, 8 channel on the other side of the mixer and the Groups and master outs are near the middle of the mixer. For some reason we were blinded in not seeing the red mute lights in that area of the mixer as there are other red lights in the area for other things. Later I learned that a recently hired youth leader came from a church were the sound system was so unstable that you had to mute everything all the time. They muted anything that wasn’t needed and because they left the mixer on 24/7, they had the habit of muting the master outputs as well. The head sound tech and I had a good laugh at the whole experience. For me, I should have known better as this is about the 3rd time something like this has happened. This is the first time with powered speakers, but before I had people thinking there was something wrong with the mixer. So please, unless you have a wonky unstable system, please don’t use the master mute switches. They are great for a studio but not for live sound. Posted in Rants | Tagged: acoustics, Amplifier, analog, Church sound, church sound system, Church Sound Systems, Mixing, Signal Processor | Comments Off on I Hate Mute Switches! Congregations can sing at 105dBa. At least that is what they do in churches that I have fixed and that does happen in other churches too, that perform well. When they do sing that loud, what do you do? Or, what do you do when the congregation is starting to drown out the sound system? Keep pushing the sound system to keep up with them. Keep the sound system at 90dB and let the congregations voices dominate. Lower the sound system FOH levels so that the congregation can enjoy what they are doing. Push the sound system to drown out the congregation as always regardless if the sound system is distorting or not. Please tell us what you do when mixing. Posted in Church Acoustics, Church Sound Systems | Tagged: acoustics, Architect, Cathedral, Church, Church acoustics, church sound system, Church Sound Systems, churches, diffusers, Digital Mixer, FOH, house of worship, Mixing, Sound Pressure, SPL | Comments Off on Singing at 105dBa! Question! What would you do to fix the Acoustics of this Church? You have a church that seats 750 people. It is a simple rectangle room with 30 ft walls, 40 ft to the peak, 80 ft wide and 140 ft long. The reverb is 2.2 seconds at 300 hertz and 1.3 seconds at 2000 hertz. An Energy Time Curve test show reflections over 30dB at one second on the ETC in the 300 hertz range. The floors are carpeted and the pews are padded seats and backs. All of the walls and ceiling are insulated drywall on 12 inch centers. Basically there is about 30dB of excess energy at 300 hertz. 300 Hertz has a wave length of 3.75 ft. 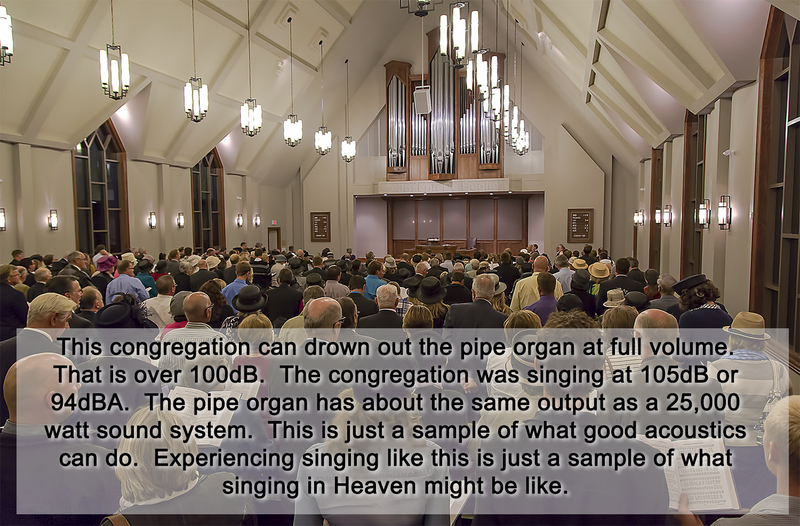 The church has already tried 4 different sound systems over 10 years and all of them were designed and installed by companies that are supposed to be the best in the business and they all started off saying that the room needs to be fixed – but church board members vetoed anything that would change the aesthetics of the room – but it was OK to hang 2 ugly line arrays which lasted only 6 months. The church is now asking for another sound system but this time all of the professional audio companies turned down the project and said to the church don’t call us back until you fix the room. 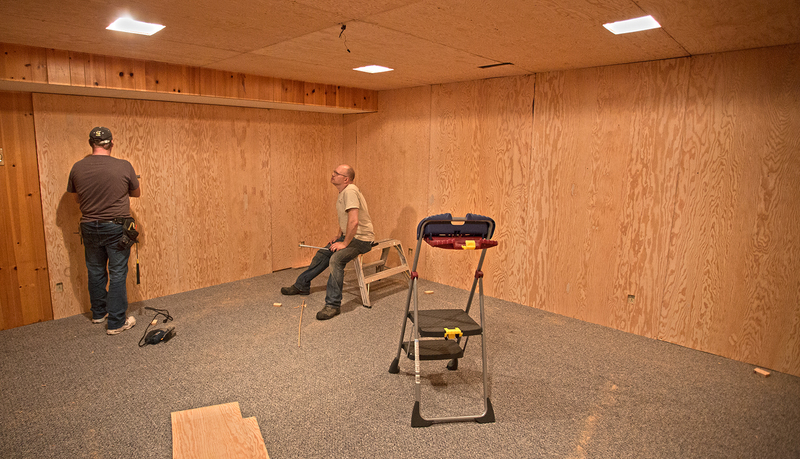 Now the church board has relented and they are allowing acoustical panels to be mounted on the walls. What acoustical method or system would you use to fix the problem? What will reduce energy 30dB in this space? 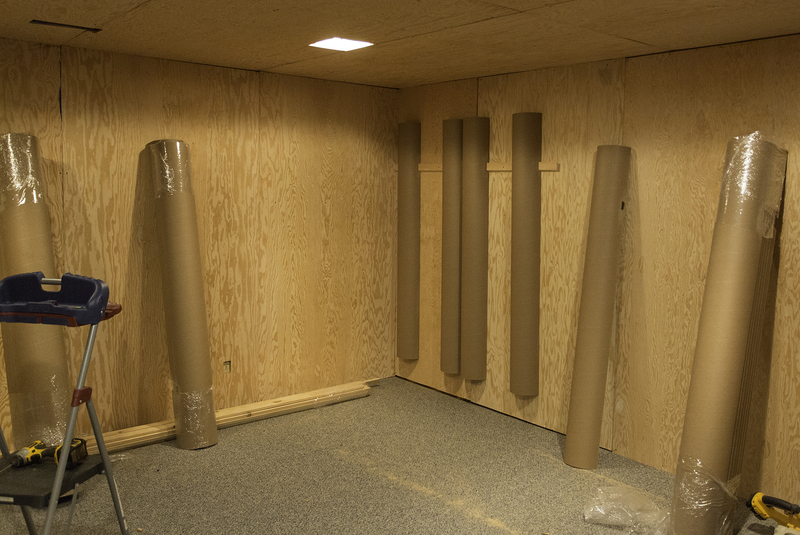 For all the walls in the church, between windows, doors and bulkheads, there is only 35% of the total wall space available to mount acoustical panels on. Major issues are – Stage noise, floor monitors as loud as main speaker system in the first 10 rows. Only 20% of the congregation is ever singing. Speech intelligibility is below 85% in full range – if you roll off the sound system at 200 hertz speech intelligibility improves to 88%. Gain before feedback is very poor after 3 or more microphones are turned on at the same time. Subs never really sound right. Pastor hears echoes all the time off the side walls when preaching. Drummer can never hear himself or the other worship team members – even with the headset monitors. The are currently using electronic drums but they have tried drum shields and booths without much satisfaction. 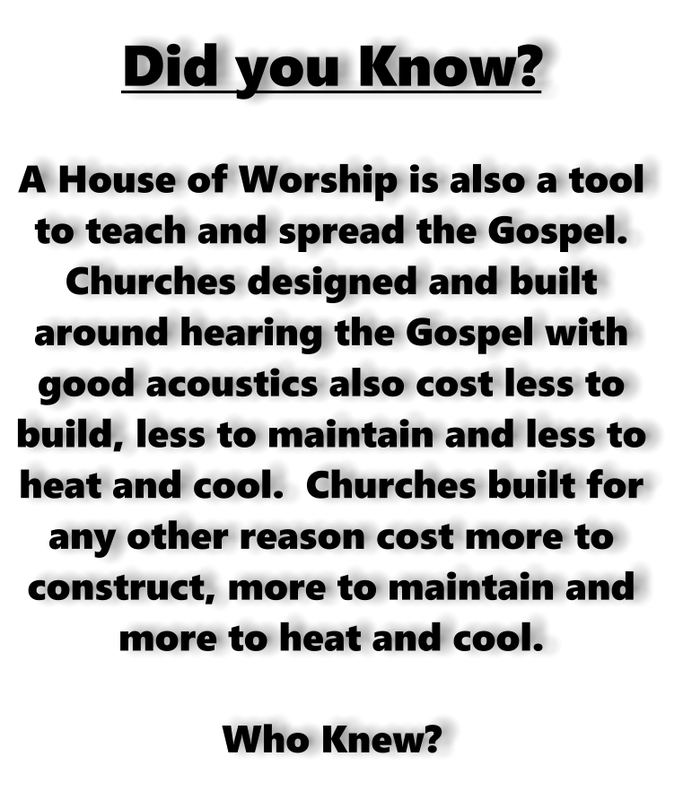 The church used to have a 40 voice choir but they never sounded very good and now with over $150,000 invested in a praise and worship team with all the latest state of the art technology and higher trained sound engineers, they sound no better than what the choir did years ago – but they are better at entertaining people! 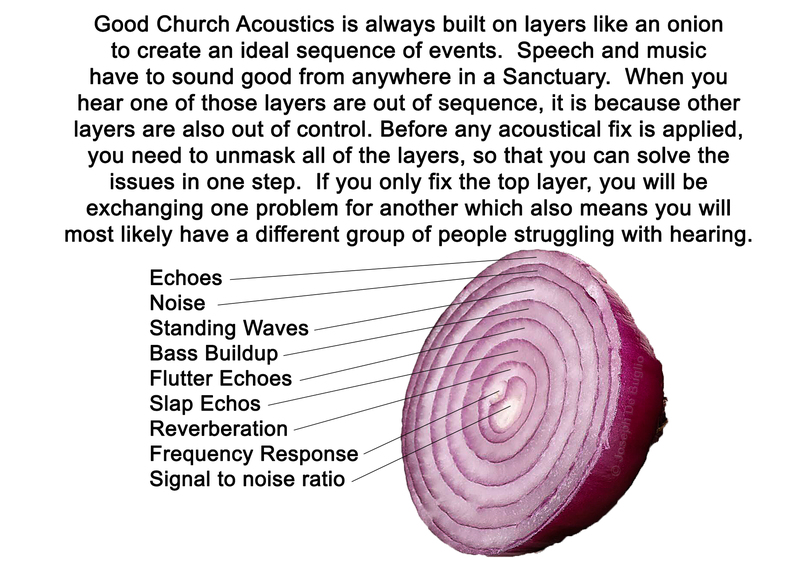 Posted in Church Acoustics, Church Sound Systems | Tagged: Acoustical Blue print, acoustics, Amplifier, Architect, barrel Diffuser, Cathedral, Church, Church acoustics, Church sound, church sound system, Church Sound Systems, drywall, EQ. Equalizer, Hearing, house of worship, Microphones, pipe organ. worship, Signal Processor, standing wave, windows, worship | Comments Off on Question! What would you do to fix the Acoustics of this Church?